On Saturday, December 2 at approximately 1345 hrs, Stewartstown VFC and surrounding companies were alerted for a reported barn fire at 19022 Five Forks Road in Hopewell Township. 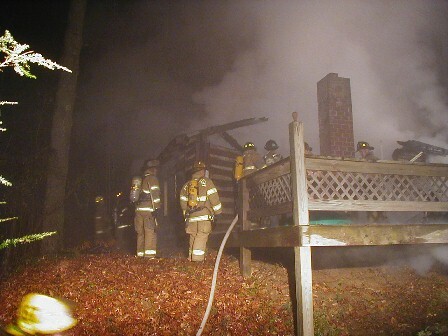 Chief 54-1 arrived with smoke showing from the barn. Units found fire was in between the basement ceiling and first floor. Water supply was set up on the home owners property. The fire was placed under control about 45 minutes and crews remained on scene for approximately two hours for overhaul. Units on scene: E54-2, E54-3, WT54, E54-4, E61-1, E58-1, TOW58. *Working Fire*: E56-4 to Station 54, A58-1. Click Here to see it on the World of Fire. On Sunday, December 3 shortly after 2:00pm, Darlington (HC 9) and surrounding companies were alerted for a dwelling fire with possible entrapment on at 1910 Whiteford Road. Units arrived on the scene advising a working fire in an attached garage extending into the dwelling. 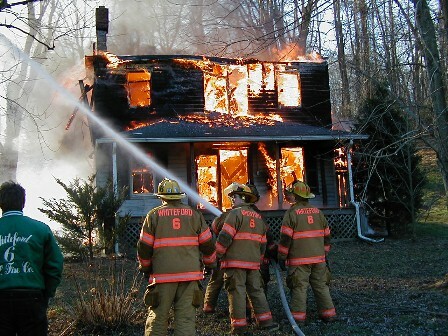 It was later advised that there was no entrapment and units made quick work of the fire. Other companies on the scene included: Whiteford VFC (HC 6) and Delta-Cardiff VFC. Click Here to see it on the World of Fire. 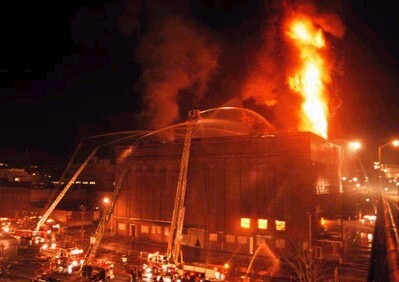 1813 hours on Sunday, December 3, 2000 marked the 1-year anniversary of the tragic fire that took the lives of 6 Worcester, MA firefighters in a cold storage warehouse. Like others across the country, East Enders paid tribute to the fallen heroes by blowing E-3's federal Q for 30 seconds at 1813 hrs. REST IN PEACE, BROTHERS. On Saturday, December 2, the Whiteford Volunteer Fire Company conducted a training burn on Doyle Road in Harford County (MD). The 2-story wood framed dwelling had been previously damaged by fire. Other companies participating included Delta-Cardiff and Darlington (HC 9). The training session went very well and companies took up by early afternoon. Additional photos: Folding Tank Ops. , R.E. & the Tanker (again). 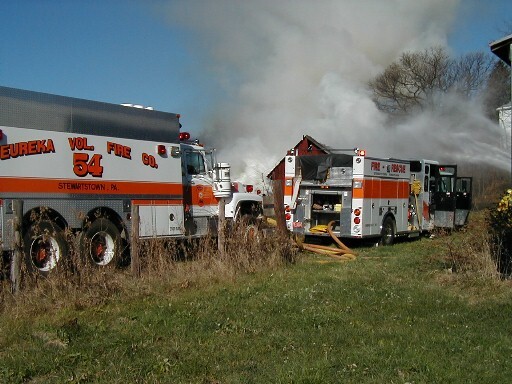 On November 29, 2000 at approximately 2300 hrs, Delta-Cardiff (57) and Fawn Grove (56) fire companies were dispatched for a reported structure fire on Mulberry Trail in the Susquehanna Trails area of Peach Bottom Township. Chief 57 arrived on the scene and reported a working fire in an unoccupied dwelling. E56-4 was the first arriving engine and crews from 56 and 57 stretched attack lines to quickly extinguish the fire. Additional photo: Crews at work. 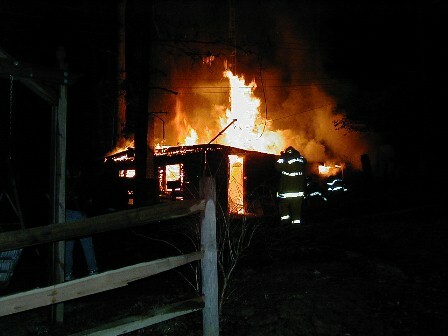 On Friday, November 24, 2000 at 1205 hrs, Station 54 (Stewartstown) was alerted for a reported barn fire on High Street. Chief 54 arrived with a fully involved barn and requested a 2nd alarm assignment. The first in engine caught a hydrant and additional water was supplied from the pond in the Stewartstown Station development. Units operating: E54-3, WT54, E54-4, E54-2, A54. *2nd Alarm* E61-1, E61-2, E56-4, E56-3, TOW58, E45-1. EAST END MAKES COVER OF "PA FIREMAN"
If you look closely, you can see Engine 3 on the cover of the November 2000 issue of the "Pennsylvania Fireman". 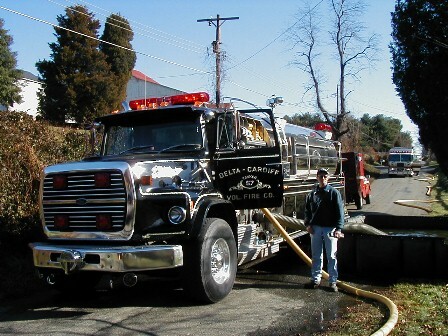 The photo was from the Mack Truck 100th Anniversary celebration held in Lititz, PA. The October 1 event was organized by Mack buff Harvey Eckert and consisted of 64 pumpers, 6 aerials, 4 tankers, 3 squads, 4 tractors, 1 quad, 1 tower ladder, and 1 command unit. At noontime, all apparatus sounded their sirens and airhorns for several minutes. Engine 3 arrived as part of a convoy from Maryland consisting of 12 apparatus. It is believed to be the biggest gathering of Mack Fire Apparatus ever! Check out the full story on page 12. EAST ENDERS TAKE TRIP TO F.D.N.Y. 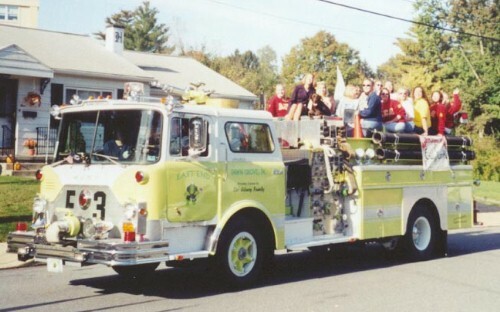 On November 1, 2000, several members of East End boarded a bus bound for New York City. The trip was arranged by FF Dave Badders of the Towson (MD) Fire Station. Highlights of the trip included a ride on one of FDNY's fire boats, a stop at the Brooklyn Communications Center, and a visit to Queens. 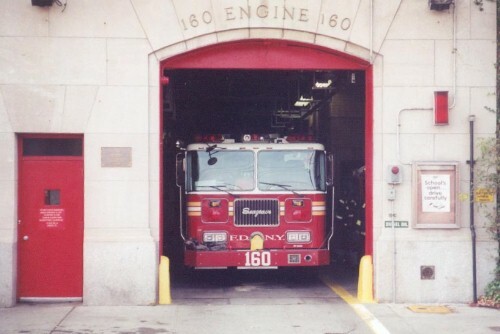 One of the day's most notable stops was on Staten Island at the quarters of Engine 160 and Rescue Co. 5. In October, East End Volunteers made their annual journey to Millersville University for the annual Homecoming Parade. While in line, it was learned that the Alpha Sigma Alpha sorority was without a ride through the parade. So with a little arm twisting, we agreed to haul the sorority through the parade. Riding on the "box" with Liberty and supporting the S. June Smith Center was sorority member Erica Kunkle. A good time was had by all. East End is proud to announce that our website has been awarded the Emergency Web Site of the Week Award by Chief Engineer Ron Buskirk of the Silverdale Fire Company. According to Mr. Buskirk, the site was reviewed by a panel of judges and was found to be outstanding in all around promoting of the fire service in our area. The Silverdale Fire Company, Station 59, is located in Bucks County, PA and protects Silverdale Boro's population of approximately 900 residents. They also cover a 12 sq. mi. portion of Hilltown Township. East End would like to thank Mr. Buskirk and the Silverdale Fire Company for bestowing this award upon our website. A NIOSH report investigating the death of Kansas City Fire Department Battalion Chief John H. Tvedten (pictured left) suggests malfunctioning radio communications complicated the fire incident at which he died. 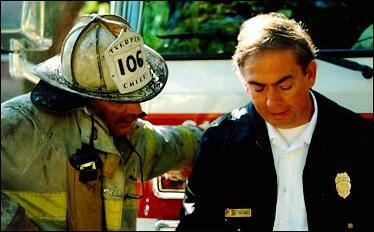 Tvedten, 47, died of carbon monoxide during a paper warehouse fire on December 18, 1999. 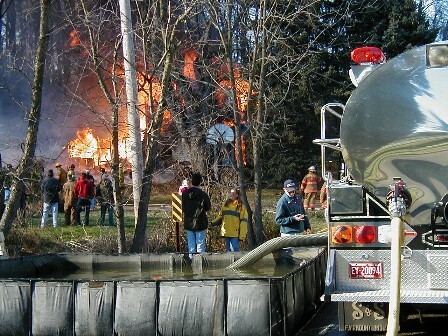 At around 1:20pm on Tuesday, November 7, 2000, Delta-Cardiff Volunteer Fire Company (57) and surrounding departments were alerted for a silo fire next to a barn on Hushon Road in Peach Bottom Township. Brush 57 and Harford County E612 arrived to find a working fire in a grain silo with exposure to a barn. Units deployed (2) 1 3/4" handlines to contain the fire and protect the exposure. After several hours of overhauling the burning grain, units were released. Companies operating: 57, 56, HC 6, E54-3 to Sta 56, E55-2 to Sta 57, HC E714 to Co 6. Check it out on the World of Fire report for 11/7/00. EAST END'S NEWEST MEMBER -- IT'S A BOY! East End Volunteers are pleased to announce the arrival of our newest member, Nozzleman Carson. 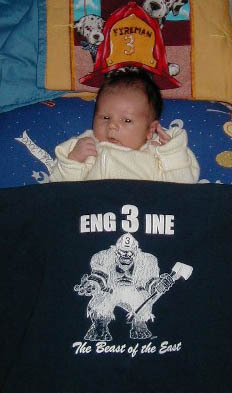 Carson arrived on the scene on Sunday, November 5, 2000 at 0730 hrs. He is 20 1/2" long and weighs 8 lbs, 11 oz. We are looking forward to Carson riding in his first parade on Engine 3!